The IVV development group has been conducting research on the level of motivation necessary for students to complete assigned IVVs outside of class as well as on the impact of the IVVs on student learning of concepts targeted by the IVVs. Interactive Video Vignettes are designed as ungraded assignments. Keeping the vignettes ungraded helps ensure that students will feel free to make authentic predictions on multiple-choice questions without feeling they are being judged. Since vignettes are done outside of class, we wanted to understand how to motivate students to complete them. Across six semesters we provided students enrolled in introductory physics at the University of Cincinnati several different incentives for completing the vignettes. Each level was tested across all courses for a given term. The levels of motivation tested included asking students to complete the vignettes to: (1) increase their understanding of the concepts, (2) prepare for a related question on the next exam, or (3) receive extra credit for completion of an IVV either on an exam or as an assigned homework activity. Completion rates for motivation levels (1) and (2) were below 40%, but for level (3) they were over 80%, making it clear that students need completion credit to motivate them to do the IVVs outside of class. 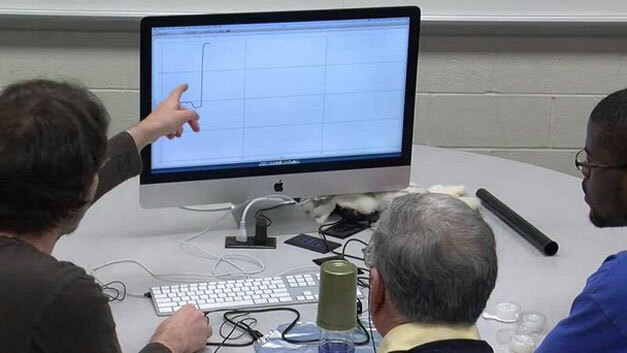 In order to gauge the impact of IVVs on student learning, a controlled study involving three instructors across six sections of algebra- and calculus-based physics was conducted at the University of Cincinnati. Each instructor taught two sections of the same course during the same term, and used a similar teaching approach and course materials across the two sections. However, one of the two sections for each instructor was assigned four IVVs (dealing with projectile motion and Newton's three laws) while the other section was provided standard textbook problems instead. Students were pre- and post-tested at the beginning and end of the term using the Force Concept Inventory (FCI) plus five additional questions. The additional questions were written as part of this study to assess student learning of concepts specifically targeted in each of the assigned IVVs. Although student pre-test scores across the treatment (321 students) and control (244 students) groups were similar, significant differences in post-test scores were found for questions related to projectile motion and Newton's Third Law. In fact, up to double the number of students in the treatment group shifted from incorrect to correct reasoning on the post-test compared to the control group. On the post-test question for projectile motion, 91% of students in the treatment group indicated that the horizontal speed of a projectile remains constant whereas only 79% of students in the control group made a similar correct choice. For questions associated with Newton's Third Law, including two from the FCI and one written for this study, on average 66% of students in the treatment group and 49% of students in the control group were able to correctly apply Newton's Third law in scenarios involving the collision of objects of different mass. Preliminary versions of the Newton's First Law and Newton's Second Law vignette were studied and found to have a modest effect on learning. These vignettes have been re-edited and will be tested further during the next year.